Designed from the ground up for military and law enforcement personnel operating in a variety of austere environments around the globe, the 3M Cogent Fusion handheld device provides these professionals a lightweight, wireless, multimodal biometric collection and identification solution. Built to U.S. Department of Defense MIL-STD-810F and Ingress Protection (IP) standards, the Fusion device is highly rugged, yet fits in the cargo pocket of standard tactical trousers. MI3 is 3M Cogent’s latest multi-biometric handheld fingerprint identification device for military, law enforcement, and civil government applications such as remote subject identification, disaster scene management, ID document authentication, traffic citation, and much more. 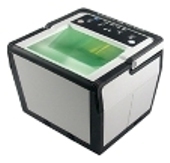 With an array of user-friendly features, the device can capture forensic quality fingerprints and high resolution portraits. MI3 allows users to quickly and easily perform in-the-field identifications. By using its flexible modular attachments, it can support multiple forms of card interfaces: Mag-stripe, contact, and contactless. As an option, MI3 can be equipped with a USB barcode scanner and a 3-inch thermal printer module. MI2 is 3M Cogent’s most ergonomic handheld fingerprint identification device. With advanced features such as a 500 ppi optical sensor, color LCD touch-screen, and a built-in camera, MI2 is ideal for enhancing identity verification programs for military, law enforcement, and other types of agencies. Based on proven biometric capture technology, the compact, mobile solution enables users to access crucial data in challenging environments, such as those found in national border control areas and military zones. Running on a commercially-available Personal Digital Assistant (PDA) device such as a Pocket PC or a BlackBerry smartphone, 3M Cogent’s MobileID software delivers the power of an Automated Fingerprint Identification System (AFIS) in a portable, handheld format. When combined with BlueCheck, 3M Cogent’s latest portable capture device, MobileID allows users to quickly and easily perform in-the-field fingerprint identification. 3M Cogent offers the CS 500e, a compact FBI-certified livescan system, to capture and process plain images consistent with NIST and FBI standards. 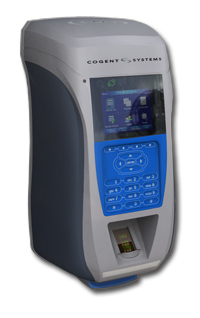 The 3M Cogent CS 500e features true real-time fingerprint capture and image display with no moving parts. The device captures four finger slap fingerprints of both hands and two thumbs in three quick and easy steps. The associated software application enables users to create the tenprint record, check quality, capture demographic data on the workstation, and electronically transmit the record. The CS 500e application software uses the 3M Cogent algorithm tested as one of the most accurate available by NIST in the SlapSeg04 Evaluation Testing. The 3M Cogent algorithm was also one of the fastest algorithms providing slap fingerprint segmentation. The SA-4ii, 3M Cogent’s latest fingerprint OEM module, features a state-of-the-art DSP processor providing increased performance and power efficiency. Designed specifically for OEM devices requiring highly secure biometric authentication and identification, such as time and attendance or access control, the SA-4ii OEM module is 100% backwards compatible with the previous generation of the SA-4 OEM modules. Supplied with a 500 ppi fingerprint sensor, the SA-4ii OEM module has built-in commands to facilitate the integration of biometric components into new or existing products. The SA-4ii OEM module also features an RS232 port and a TTL port to facilitate communication with a wide array of input devices, such as a PC host or a magnetic stripe, contact, or contactless smart card reader. The SA-4ii OEM module uses a unified template that is compatible with 1:1 authentication and 1:N identification algorithms, eliminating the need to re-enroll users when switching between authentication and identification modes. 3M Cogent BlueCheck® Mobile Fingerprint Scanner Using Bluetooth communication, BlueCheck® can remotely transfer secured captured fingerprint data to any COTS Bluetooth-enabled smartphone, Blackberry® handheld, laptop or computer.This modular feature enables law enforcement agencies to configure BlueCheck® with their existing equipment and infrastructure. With 3M Cogent’s BlueCheck® host applications, the host device can submit ANSI-NIST format files via SMTP or FTP to a remote server or to a statewide Automated Fingerprint Identification System (AFIS). BlueCheck® receives the search results from the host and displays the results on its LCD display, providing timely and accurate information for law enforcement personnel. 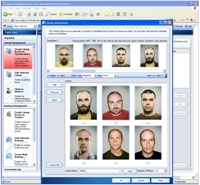 Mugshot System 3M Cogent’s CMS 3.0 provides a Web-based, service-oriented, modular mugshot photo investigative tool for law enforcement agencies. With its user friendly navigation, users can easily create and edit lineups, mug books, and booking records. Law enforcement agencies can securely access the CMS database and search for suspects immediately from the crime scene or patrol car through a standard Web browser; no dedicated software is needed. Running on a commercially available backend server, CMS uses a NIST standard interface that seamlessly integrates with 3M Cogent’s products, third-party AFISes, and LiveScan systems. MiY-ID is 3M Cogent’s latest outdoor multi-purpose, multi-functional biometric access control reader. As new security standards emerge, companies are looking for a security product that meets current PACS standards for PIV, CAC, TWIC and others. 3M Cogent’s MiY-ID product allows them to meet current standards and easily conform to changing standards without having to replace their PACS readers. With its ground-breaking “Make it Yours” application development platform, MiY-ID can virtually interface with any PACS and government credentials such as PIV, TWIC, and CAC. The MiY-ID’s core product foundation and framework allows third party customization of almost any part of the product, leveraging future technologies as they are introduced.